A temperature controlled environment is a necessary feature for custom home wine cellars Riverside CA, in order to preserve the quality of wines for a prolonged period of time. Climate control systems help keep the temperature and humidity at constant levels, and ensure that wines are aging under the proper storage conditions in home wine cellars. There are three primary types of wine cellar refrigeration systems: self-contained systems, ducted self-contained units, and split systems. A self-contained system is a window-style unit that mounts easily through the wall and vents to an adjoining room. Ducted, self-contained units make use of ductwork for cool air flow and heat exhaust. Depending on the installation, this unit helps eliminate noise and eliminates the presence of unwanted equipment inside custom wine cellars. As the name suggests, split wine cellar refrigeration systems split the evaporator and condenser into two separate units. 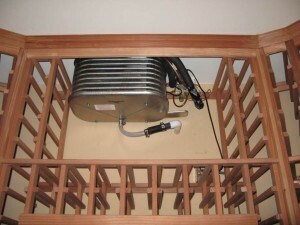 This feature allows the condenser to be placed in a remote location, which helps dissipate noise and heat, while the evaporator is installed inside or near the wine cellar. Both units are connected by either a line set (for ductless split) or ductwork (for ducted split). This recently completed wine cellar refrigeration installation project in Temecula, California, shows how a cooling system can be efficient and unobtrusive at the same time. Arctic Metalworks supplied a split system to this Temecula home wine cellars Riverside CA project, which was constructed under the stairwell. 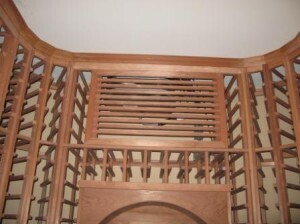 Wine cellar refrigeration systems with a split feature offer versatility in installation options. Separating the evaporator and the compressor helps promote a quieter wine cellar environment and efficient operation. The compressor, which is the noisiest part of the refrigeration equipment, can be installed in a remote place (e.g. garage, attic, backyard). In this particular wine cellar refrigeration system installation project, the Arctic team installed the evaporator unit just above the arched frame. A specially designed grill cover keeps the cooling unit hidden from view. The grill is manufactured from the same wood variety as the wine racking systems, in order to create a smooth and uniform appearance. The condensing unit was placed outdoors to keep it well-ventilated at all times. The evaporator and condenser of the ductless split refrigeration system are connected by a line set, consisting of small copper tubing and electrical wiring. This type of cooling equipment is unobtrusive and has aesthetic advantages, since it does not require ductwork systems to circulate air flow. Apart from the wine cellar refrigeration installation, the Temecula home wine cellars Riverside CA project also involved the installation of a special cooling system for the client’s theater equipment room. To reduce project cost, the Arctic team installed one condensing unit and attached two separate evaporator coils, one for each room. In order for a wine cellar refrigeration equipment to function efficiently, the custom wine cellar space must have the following prerequisites in place: proper insulation, a vapor barrier, and an exterior grade door. These key components ensure that optimum climate conditions are maintained, and thus protect the overall quality of wines. 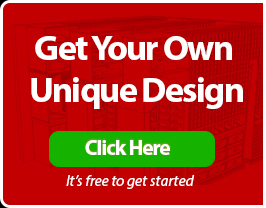 Established in 1962, Arctic Metalworks specializes in manufacturing and providing the best wine cellar cooling systems in the wine cellar industry. The company also provides service and maintenance of refrigeration equipment for home wine cellars. Arctic recently added a wine racking division that focuses on providing handmade wine storage and display racks made from different wood species.